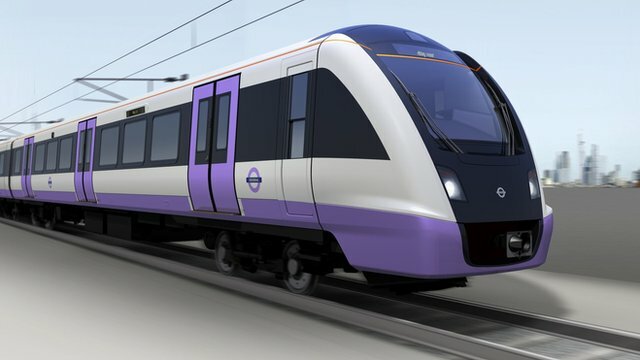 Bombardier has won a £1bn contract to provide trains for the London Crossrail project, the government has announced. The company will provide 65 trains for the Crossrail service, which is set to open in 2018. The trains will be manufactured and assembled at Bombardier's plant in Derby. The Department for Transport (DfT) said Bombardier's contract would support 760 manufacturing jobs and 80 apprenticeships. In total, up to 340 new jobs will be created, said a spokesperson for Bombardier. The DfT also said that about 74% of the amount spent on the contract would stay in the UK economy. Canada's Bombardier beat Japan's Hitachi and Spain's CAF to secure the deal. 'Great boost' The Crossrail system is due to run from Maidenhead and Heathrow Airport in the west, to Abbey Wood and Shenfield in the east. It will aim to provide faster journey times and up to 24 trains per hour between Paddington and Whitechapel during the peak. Business Secretary Vince Cable said the decision gave the Midlands a "great boost" and represented a "real vote of confidence in British manufacturing". He said: "The government has been working hard with industry to support the UK rail supply chain to maximise growth opportunities through contracts like this." 'Relief' The government said the network will boost London's rail capacity by 10%. It also estimated the new service would support 55,000 full-time jobs around the country. Bombardier lost out to German firm Siemens to build new train carriages for the London-based Thameslink route in 2011. Unite national officer Julia Long said: "This is great news for the workforce at Bombardier and for Derby. "After the disastrous handling of the Thameslink contract this news must come as a massive relief for the skilled men and women at Bombardier." She said the jobs would be "valuable" for young people wanting a future in manufacturing, and that the decision was a "tribute to the skills and dedication of the Derbyshire workforce". Labour MP for Derby South, Margaret Beckett, said after Thameslink, Bombadier's workers were "very much put on their mettle". She said: "Everybody was devastated by the Thameslink decision, but they have really got stuck in and proved that they are the right people to have this contract, which I have no doubt they are." Each new train will be 200 metres long and be able to take up to 1,500 passengers. The trains will also be air-conditioned, with linked, walk-through carriages, and provide live travel information. Mayor of London Boris Johnson said the trains would "revolutionise" rail travel in the capital and lead to economic growth in Derby and across the UK. He said: "With a firm on board to deliver a fleet of 21st century trains and the tunnelling more than halfway complete, we're on track to deliver a truly world-class railway for the capital." Bombardier has built, or has on order, 60% of the UK's rail fleet. As we are aware the main railway line along the South Coast through Dawlish, has featured heavily in the media over the passed few days. The following set of images may focus our minds now how the devastation wreaked by the elements, have now set Network Rail an enormous task to re-connect the now severed line. All the images have been kindly provided courtesy of Network Rail. A £100million plan to redirect train services in Devon and Cornwall could be revived after huge waves washed the line away. The government revealed the army could be called in to help repair the track at Dawlish after huge waves demolished the sea wall on the south coast. But Transport Secretary Patrick McLoughlin today announced he has ordered a ‘rigorous review’ into alternatives, after the last Labour government rejected the need to reroute the line. MPs demanded to know why £50billion is being spent on the HS2 line linking London to the north of England while services in the south west are at the mercy of the weather. The destruction of Dawlish's railway line has effectively cut off rail links to Cornwall, with a 200ft stretch of tracks left mangled and hanging over the boiling seas. On the seafront huge granite blocks had been ripped out by the force of the crashing waves and gales and 20 homes had to be evacuated and people moved to a leisure centre. Network Rail has warned the line, built by Isambard Kingdom Brunel and popular for its stunning view, could be out of action for weeks. Labour warned the closures are costing the area millions in lost revenue, with the West Country's crucial tourism industry threatened by the loss of a vital transport link. Transport Secretary Mr Patrick McLoughlin last night held urgent talks with Network Rail and MPs from Devon and Cornwall. In the Commons he revealed he had ordered a report into ‘the whole question of the resilience of the South West’. It raises the prospect of two lines closed half a century ago being reopened to carry trains away from the seafront. In 2006 Labour ministers ruled out the idea of re-routing. Then-transport minister Derek Twigg said: 'Network Rail recognises the importance of the line and continues to devote considerable resources to maintaining it to an appropriate standard. Now the dramatic destruction of the line means the idea is set to be revisited. 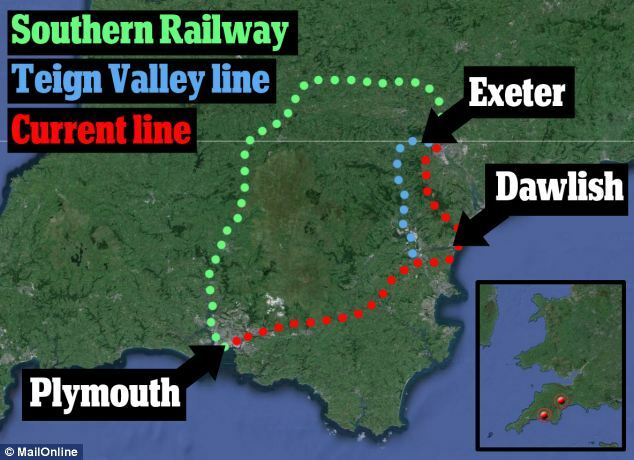 One option is to reopen a 50-mile stretch of the former Southern Railway from Exeter to Newton Abbott which was closed in 1958, which would mean trains no longer stopped at Teignmouth or Dawlish. Another more costly plan would be to revive the Southern Railway line which links Exeter to Plymouth via the northern edge of Dartmoor. It would mean there would be no rail services to Dawlish, Teignmouth, Torbay, Totnes or Ivybridge and take trains on a 50-mile detour, adding to journey times. Both options would be hugely expensive and controversial for those areas which would lose services. But ministers faced cross-party calls in the Commons for radical action and investment to solve the problem. Former Labour Cabinet minister Ben Bradshaw, MP for Exeter, demanded to know what Mr McLoughlin is ‘doing to ensure this vital mainline into the South West is reopened as quickly as possible and what he is going to do in the long-term to help ensure that the vulnerability of the line at Dawlish is dealt with’. The Government has found an extra £30million to help councils deal with the damage caused by the severe weather outbreak. The money for this year is on top of £100million announced by David Cameron yesterday. Communities Secretary Eric Pickles said 42 new flood defence schemes are also planned for 2014-15, as he hailed the Government's £3.1 billion capital investment commitment as the largest by any government. He told MPs: 'In the short-term, I can announce that the Government will provide an additional £130million for emergency repairs and maintenance, £30million in the current year and £100million next year. However, UKIP leader Nigel Farage called for Britain’s foreign aid budget worth £11billion to be immediately suspended with the money diverted to help areas in the UK devastated by flooding. The UKIP leader insisted ‘charity begins at home’ and urged the government to step up its response to the colossal damage to homes, businesses, roads and railways. Mr McLoughlin insisted that he takes his responsibilities to Devon and Cornwall ‘incredibly seriously’. ‘I also would like to certainly point out that over the next five years between 2014 and 2019 NR will be spending £38billion on the existing network. Anne Marie Morris, Tory MP for the Newton Abbot seat which includes Dawlish, said the line ‘is a vital artery linking the South West to UK and a long term solution to coastal rail flooding must be found now’. Devon County Council leader John Hart also demanded Government help for the South West following the latest storms. He said: 'Once again we are cut off from the rest of the country by rail. Now following the storm damage at Dawlish, the rest of the peninsula is also cut off and we don't know when the line will be restored. The region deserves more help. We've been told we just had the wettest January in memory. But that followed the wettest January in memory last year. Network Rail has called in a specialist concrete spraying machine to shore up the damaged section of seafront, with warnings the line could be out of action for up to six weeks. Patrick Hallgate, head of the Western route, said: 'We absolutely understand the importance of the railway to the south west and will do everything we can to rebuild the railway at Dawlish as quickly and safely as we can. 'After a quieter night’s weather, we have been able to begin delivering machinery to our site compound with a view to protecting the exposed section of railway and the land behind it. We need to make sure we limit any further damage this weekend so that the significant repairs that are needed do not become greater still. Labour's shadow transport secretary Mary Creagh said: 'Freak weather is rapidly becoming the new normal in our country, and I understand the difficulties you have in giving a timescale for the Dawlish repairs, given further bad weather is forecast for Saturday. SEE ALSO THE LATEST (AGAIN) ON THE FOCUS FLICKR SITE! FIRST IT WAS THE NBfL, NOW IT'S A NTfL. WHO HAS BOUGHT THE MALTA BENDIBUS FLEET? A NEW BUS FOR LEEDS?